At Dolphin Scuba Center we carry a nice selection of Floats, Lift Bags, and Accessories that will cover most of your aquatic adventure needs from Freediving and Spearfishing, to recovery of objects from the bottom, and making yourself more visible at the surface. Abalone Floats have a tire inner tube with a heavy duty Cordura cover that acts as a combination Platform and Flotation device that will contain your tools and catch. Lift Bags will enable a diver to lift a heavy object off the bottom and come in a variety of lift ratings depending on the job at hand. Surface Marker Tubes makes sure a diver can be seen in open water where waves and surface reflection can obscure your position. 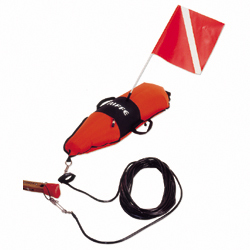 The Markers roll up into a small size and can be clipped to your BCD. Torpedo Floats are used as markers for Freedivers as well as a bouy for large fish while hunting. The Floats are available from basic material configuration to the heavy duty 2.0 ATA Float by Riffe. Dolphin Scuba Center also has other helpful accessories like the Kelp Clip, a clip to anchor on to an available strand of kelp, a tire inflater to help inflate your inner tube, and Float Line to secure your Float in place.